Sad news for Buckwild fans. It was announced today that one of the core cast members of Buckwild, Shain Gandee, 21, was found dead in his truck along with his Uncle and one other person. The last time the three were seen was Sunday night at 3 AM in a local pub. It was reported that they told people that they were going off-roading. According to MTV they were found by a friend who had been looking for them since their disappearance. The cause of death has not yet been identified. If you are not familiar with the MTV program, the West Virginia kids on this show often like to do dangerous outdoor activities. Of all the crazy things these kids do off-roading, or 'Mudding' as they like to call it, is hardly the most dangerous. They haven't declared the cause of death, but I am guessing alcohol played a part. Don't drink and drive kids. Don't. The Kanawha County Sheriff’s Office can now release the names of all three deceased individuals inside the Ford Bronco recovered today in Sissonville: Shain Gandee, David Gandee (both previously identified), and Donald Robert Myers (27 years of age), all from the Sissonville area of Kanawha County, WV. 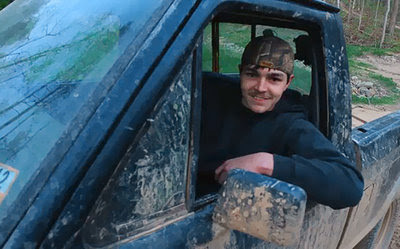 The vehicle and bodies were found by one of Shain Gandee’s friends who was searching the trails and ridges in the area for him and the others. The vehicle sat unevenly, but upright, and was partially submerged in deep mud. Mud was covering the lower part of the passenger side door of the vehicle, but the driver’s side of the vehicle was above the mud. The muffler of the vehicle was completely below the surface of the mud. The Bronco was found next to a ridge-top trail. That section of the trail itself was passable for four-wheel drive vehicles. However, the Bronco was in a mud pit next to the trail. That area is accessed by following the wooded trails for approximately one mile from Shain Gandee’s residence, near Thaxton Hollow in Sissonville. Shain was seated in the driver’s seat of the Bronco. The Bronco was removed from the mud pit by a bull-dozer. Their bodies were removed from the vehicle and have been taken to the Office of the Medical Examiner. Autopsies will be performed to determine the cause of death.